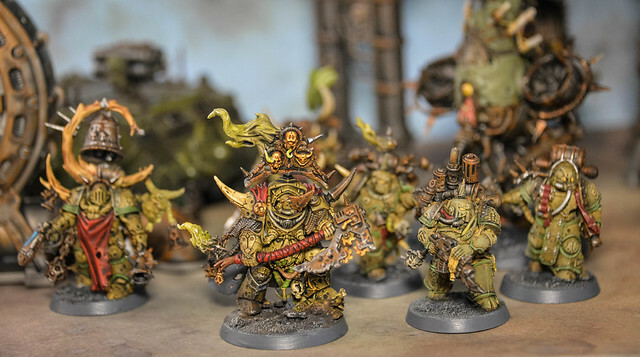 I've been looking forward to the new edition of Warhammer 40k, and the primary reason has been the knowledge that with it would come some great new miniatures. 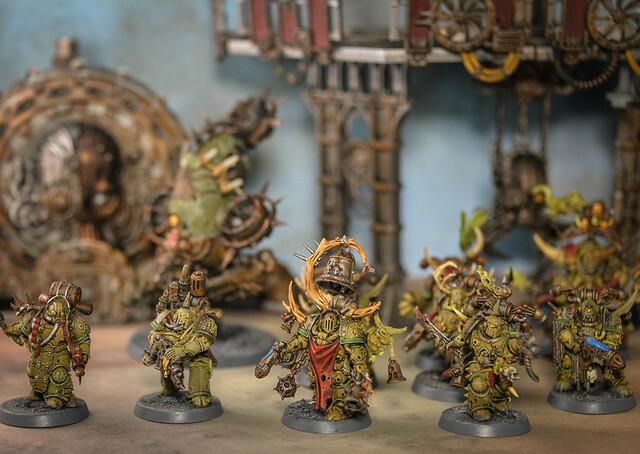 The new starter box comes with the models that have finally convinced me to explore one of the 40K aesthetics that I rarely tackle - the forces of Chaos - specifically those loyal to Nurgle, The Death Guard. Having painted so many Tau models down the years, with their sleek lines, and futuristic armor, approaching the plague-ridden and decaying forces of the Death Guard is very much a change of pace. I do enjoy trying to replicate certain styles consistently, and this was no different. 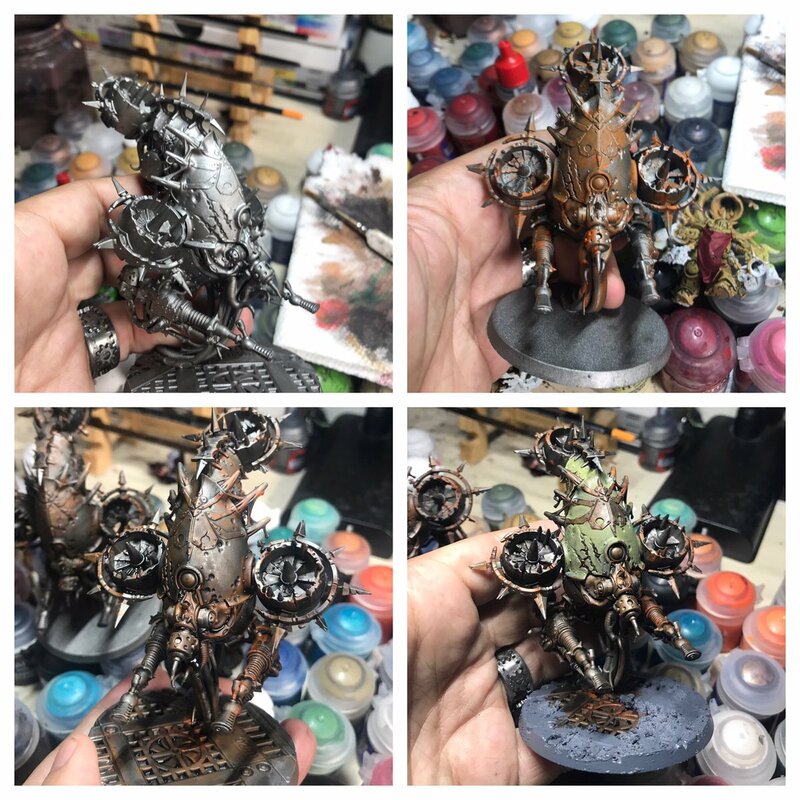 I wanted to capture the rusty, plagued, look that these new sculpts sell so well. 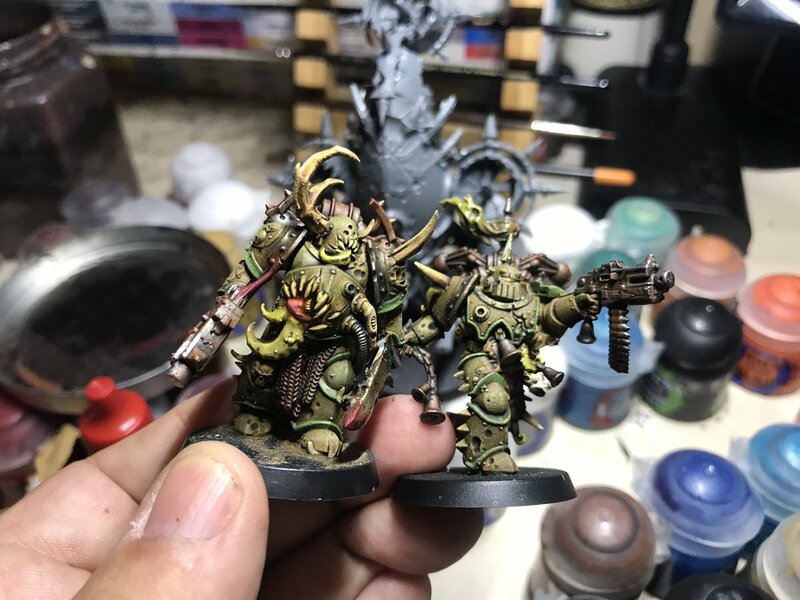 I went with a classic Plague Marine color scheme in the end. 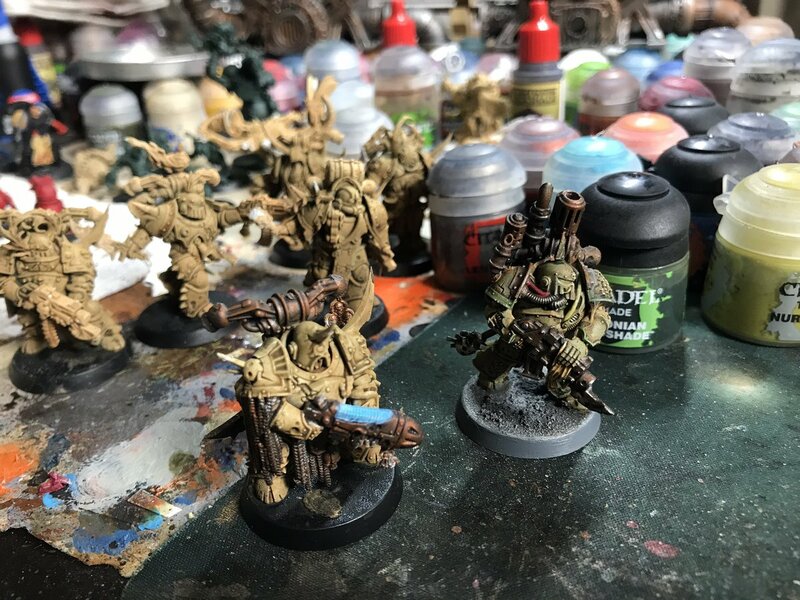 I toyed with the idea of going with the egg-shell alternate schemes you sometimes see, but decided to see what I could make of all the greens instead! 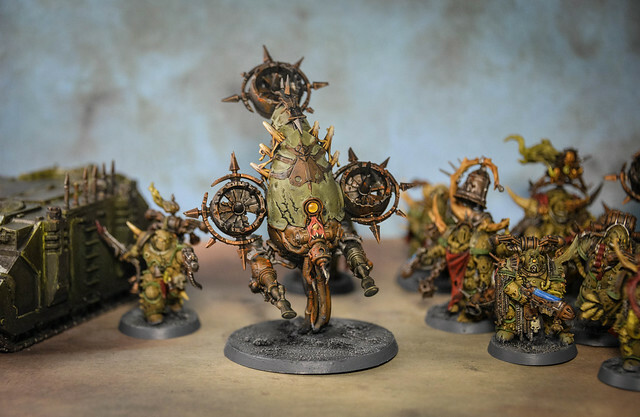 I like painting rust effects, and the new Bloat Drones were a great opportunity to refine the techniques I use. I was pretty happy with the results and it will form the basis of how I handle many of the Death Guard vehicles and armor in the future. 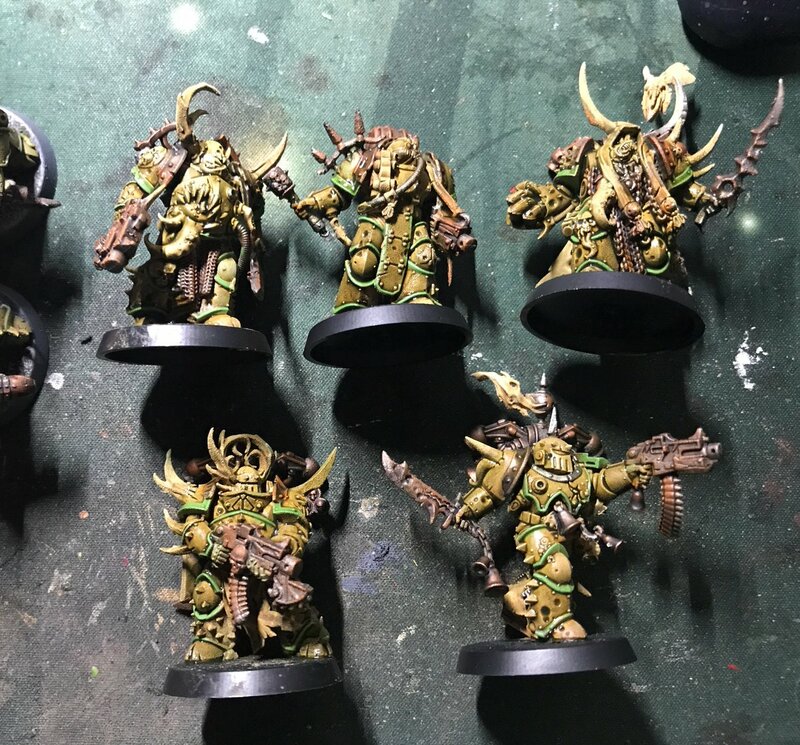 Then I started to tackle the Plague Marines. I used a multi-wash technique on these to build up the grime and give them some depth. I started with a base coat of Corax White, and then build up numerous washes of Sepia and then Athonian Camoshade. Then I picked out the details with the same rust technique as the drone, and finished up with some cleaner green lines for the trim. It had been a while since I used a production line approach for a squad of models, but it works well when you are using the same technique on each of them. Then the final detailing can be picking out all the tentacles, tongues, and other suitably chaotic appendages these sculpts have on show! 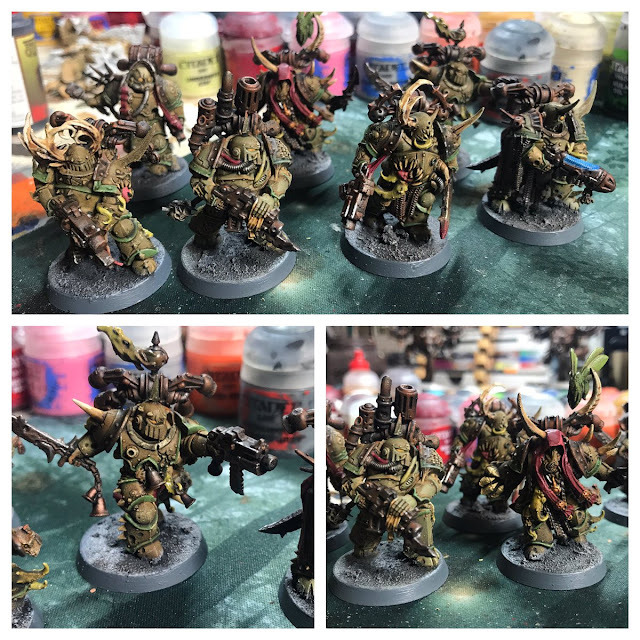 Overall I'm very happy with the start of this new army. It has been many years since I started a new 40k army from scratch, so it's been cool to explore this new aesthetic. Next up, some vehicles to support the Plague Marines, but that will be a story for another day!